Will Apple ramp up their ambitions of Apple TV or continue to let competitors like Netflix dominate the market for internet content. 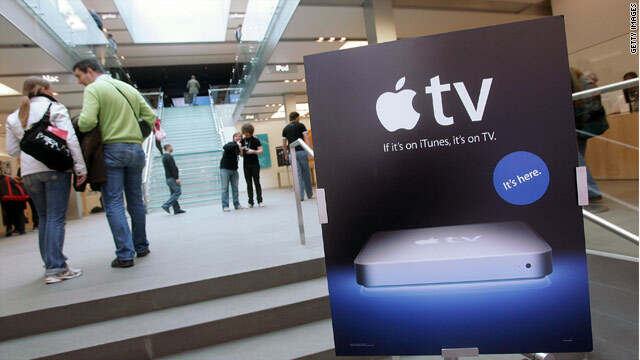 Is Apple going to make an aggressive move in the streaming media market soon? (CNET) -- Netflix is cruising. The cable guys are catching on. Wal-Mart just rumbled in. The Web's video-on-demand sector is filling up fast with some serious heavyweights. If Apple wants to make a mark in digital video that even vaguely resembles the one it made in music, perhaps the company should start treating Apple TV as more than just a "hobby." That's Apple's attitude toward the streaming-media device, said Chief Operating Officer Tim Cook, who spoke at a conference in San Francisco on Tuesday. This doesn't seem to be a good time to toy with online video. Competition is turning white hot. On Monday, the nation's retailing juggernaut, Wal-Mart Stores, announced its intention to distribute films and movies over the Internet. The company also said it had acquired Vudu, the former set-top box maker that now sells media-distribution software. Apple fan boys and girls will likely argue that every day when Apple CEO Steve Jobs rolls up Infinite Loop, he's gazing at one of the Web's leading distributors of digital movies. And just wait until the iPad debuts. That's when Jobs will really school all the doubters about Apple's ability to sell video online. Well, right now, Apple sells films and TV shows for PCs and the company's ubiquitous handheld devices, as well as the wee number of people who own Apple TVs. But studies show most people don't want to watch a computer screen for 90 minutes, according to Tom Adams, who operates Adams Media Research and has spent decades tracking consumer behavior for Hollywood. For the majority of U.S. consumers, a good viewing experience is synonymous with the living room: comfy sofas, popcorn, and the biggest screen they can afford. That is why the cable companies long ago staked out living-room turf. Netflix, the Web's top video-rental store, recently crossed from the PC to the TV thanks to dozens of partnerships with makers of set-top boxes, including Microsoft's Xbox. Sometime soon, Wal-Mart could land in the living room as well. Yet, Apple is conspicuously absent. "The whole ball game to this point has been about competing with Apple," Adams said. "They got the mobile market, (iPods and iPhones) and real marketing clout. What Apple doesn't have is a persuasive TV offering." But as usual, Apple is holding some wild cards: the aforementioned iPad and a much-speculated-about media-streaming service. Is iPad a game changer? When it comes to the iPad, Adams sounds less confident in his assertion that video-viewing is all about the TV set. He says it remains to be seen whether Apple's tablet computer is a game changer. The iPad's 9.7-inch LCD touch-screen display isn't exactly tiny. Image quality is good. The iPad can playback video up to 720p, although it can only output video to an external source at 480p. As for whether anyone is interested in the iPad, on Tuesday RBC and ChangeWave Research said a survey reveals that demand for Apple's tablet outpaces early demand for the first iPhone. What remains to be seen is whether the device actually spurs sales of video downloads. What may be more intriguing is if Apple takes the same route as Netflix and begins streaming video to people's TV sets via the Web? A film industry source told me a year ago Apple had discussed launching a streaming video service. To this point, the indications are that Apple has become a big believer in cloud computing, the term used to describe computing done on the Internet instead of on an individual computer. In December, Apple outbid Google to acquire Lala, a struggling streaming music service. Last month, CNET reported that Apple managers had told the four biggest record companies it planned to enable users to access their music libraries from Apple's servers using multiple Web-connected devices. And just this week, someone posted to YouTube a clip of the massive data center Apple is building in North Carolina. Will the servers in this facility be the cloud in which millions of iTunes users could one day store their music and video libraries? One can only wonder at this point. What we know for sure is that while Apple keeps everyone guessing about mysterious clouds and the company's hobbies, competitors aren't standing still. When a Wal-Mart store moves into a neighborhood, mom-and-pop operations typically quake with fear. Not so for the company's Internet competitors. The reason: after a decade, Wal-Mart's offline success hasn't followed it online. Wal-Mart tried challenging Netflix and failed. It tried launching a video download store and failed. The retailer didn't fare any better in digital music. But this is a juggernaut. The country's second largest company, Wal-Mart last year generated $405 billion in sales. By comparison, Apple--which ranks as the 71st largest U.S. company, according to Fortune Magazine--saw a relatively modest $32 billion. Wal-Mart has the resources to keep experimenting until a winning formula is found. And while the big-box retailer learns the ropes, Netflix will likely continue to sign up subscribers and pen groundbreaking deals with the studios to acquire content for its Web streaming service. Elsewhere, the cable operators are hammering away at their Internet video services. This is still only at the earliest development stages for Internet video. That may be why it ranks only as a hobby for Apple now. The company could be waiting for the market to mature. Apple has a long history of biding its time until an industry develops and then pouncing. That's what Jobs and company did with digital music players and more recently with e-books. Jobs once said digital books wouldn't work because "people don't read anymore" and now we have the iPad. To illustrate how far Web video has to go, Adams said the movie industry's best means of distribution -- ticket and DVD sales -- are typically a $20 billion business. While DVD sales fell to $8.7 billion last year from $10 billion in 2008, box-office sales grew 10 percent in 2009 to $9.8 billion. He said those figures dwarf digital sales. "In a sense," Adams said, "Internet video is a capability still looking for some demand."